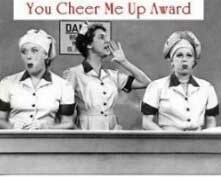 Han wonderfully gave me a “You cheer my up” award. Thank you so much….it’s cheered me up no end – up I found out I’d been having a horrid day. I need to pass this on, but do want to do it rashly….so will be back in a mo with my nominations for it. Thanks again Han (and right back at ya babe, I love you blog too with the very stylish cards that you produce) ……….and also a big thank you for the lovely stamped images they arrived yesterday. Mark has announced his “Ramble On” route for the trip from Bristol to Edinburgh. He apparently leaves from Bristol on 9th June, and plans to arrive in Edinburgh on 11th July. You can check out the itinerary here. If you can, please support him it’s for a very worthy cause – Help The Hospices. 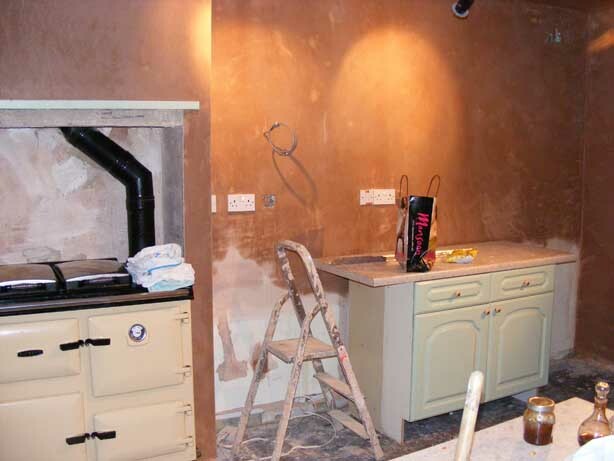 Steve the lovely (and very goodlooking) Plasterer has been here for a couple of days now……..and slowly, but surely re-construction has started. The downlighters have had to be pulled down from their position in the ceiling so that he could work, so it looks a bit space-ace with them just hanging there. 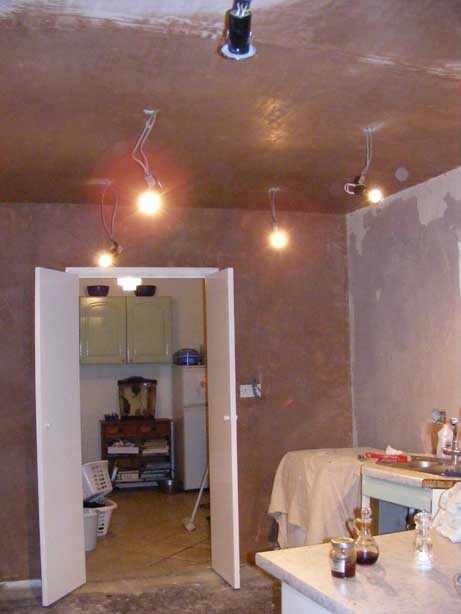 We’ve been trying not to use them too much (hence the lamps everywhere), so that the plaster doesn’t dry out too quickly. He’s back again tomorrow, and then will have to come back again towards the back end of next week, as we’ve decided to take off the disgusting white radiator, and then move the positon to the adjacent wall and have a lovely chrome ladder type one to tie in with the kitchen. To do that, we have to wait for Karl our lovely plumber to come and do the necessary, then Stevieboy can come back and do the end wall that previously held the white hideousness. 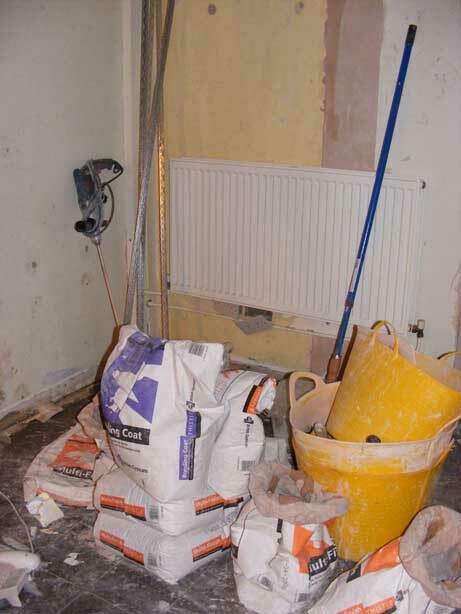 The pictures can’t express just what a mess the whole place is in, there is plaster dust all over………but, no real point in cleaning it up yet…..so we are reluctantly living like it. Oh dear, third week in March seems so very far away still. There will be no crafting tonight as we had to go over to Nutley after work to drop off the Parental Controls Micra, which has finally been sold. Bloomin’ SatNav sent me all over the Ashdown Forest, and I had a nightmare finding the place, so we’ve not long been home. Toodles has taken to her bed as Tuesday’s is a long day for her – she start’s at 8.40 and finishes at 4.30 with multi-skills as a helper before School and Gym after – let alone having nearly 3 hours in the car over to Nutley. She’s demanding cuddles with Mummy, so I’m happily off to oblige. just thought I would let you all know that UK STampers are going to be uploading weekly Sugar Nellie challenges. The first one – CHECK IT OUT! – is now up and running. They’d love you all to join in if you have Sugar Nellies. The example shown on their blog is bigger version of the picture. 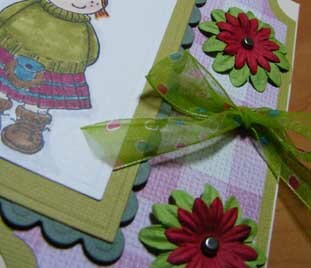 one of my Sisters’ from SBS8, has set up a SU Challenge Blog for all us UK girlies. Check it out here. There will be a new challenge every Tuesday.